Purim is as significant for Jews today as it was for the Jews in the story itself. Also, it holds immense importance for society at large. 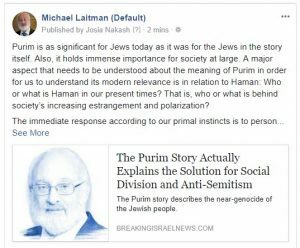 A major aspect that needs to be understood about the meaning of Purim in order for us to understand its modern relevance is in relation to Haman: Who or what is Haman in our present times? That is, who or what is behind society’s increasing estrangement and polarization? The immediate response according to our primal instincts is to personify the blame, that a President, or a group of politicians, financiers, executives or other conspiratorial schemers are behind our woes. However, beyond the face-value finger pointing, what is really behind all the social division is the divisive mindset that Haman represents: the desire to seek money, honor, control and/or power in spite of everyone and everything. This divisive mindset shuts us off from each other, separating us, harming us and masking the damage we do to each other. Today’s tumultuous social atmosphere is a calling for us to seek our common voice as a humanity that shares common values and purpose. If we use this calling to connect a little above our primal instincts, then we can create a much more peaceful and friendly society for us all. Whenever the Jewish people were at risk of ruin, it was our unity that saved us. We can use the Purim story as an eternal reminder that our unity can get us out of the worst situations, and that by uniting, we set a constructive and positive example for the rest of humanity.